Nate is the lead pastor of Neighborhood Church. 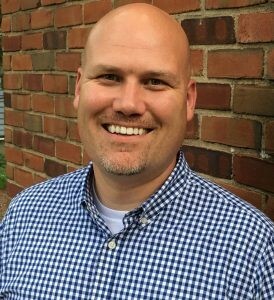 He grew up in Lapeer, Michigan and did his undergraduate & graduate work in youth ministry at Huntington University. He’s served as a youth pastor in a few different churches. Prior to moving to Adrian in 2015, Nate served at Crossroads Evangelical Church in Wauseon, Ohio for 11 years in a variety pastoral roles. Nate considers himself a proud member of the “I married way above myself” club. He and Amanda were married in 2002, and have two young sons—Eli & Oliver. Nate enjoys the simple adventures of life—family time, food, yard work, laughter and watching college football (Go Blue!). He is a member of the Adrian Kiwanis Club, serves on the Neighbors of Hope Board of Directors, and is the part-time Director of Lenawee’s Cradle to Career Partnership.